Th' Van Gough was purchased in 1982 with 94,000 miles on the odometer. The owner's name was believe it or not, Jesse James . He was a retired Colonel from the Air Force. Their home was in Sherman, Tx. The Gough was a 1975 Open Road camper. The maiden voyage was to Colorado to visit friends of ours that were in the gold mining industry. I didn't know until I was almost home that the girls had loaded more than 250 lbs. of rocks into the back of the van. The van was all ways ready to go. I shot competition archery in those days, so every weekend during the season, the van would haul three or four other competitors around the state. I drove and used the the camper till the 350 engine quit at 155,000 miles in 1985. I traded a model 29 nickel .44 magnum S&W for a rebuild job to the 350 engine and one month later had the transmission rebuilt. I put in in myself. By now 1987, The kids were teenagers and they preferred not to be seen in the Gough by their friends. Wife would stop before they reached the school. The girls preferred it this way. The Gough didn't have any A/C, so the wife was not too keen on driving th Gough during the summer in Texas. The Gough seemed to be as big ah gypsy as I. One of the problems with th Gough was the two piece drive shaft and carrier bearing. No matter how careful or how well maintained the U-joints were, of you put a heavy load on the van, you would knock out the drive line at the carrier bearing. That has been a mechanical haunt of the Gough. Around 1987, I resealed the sliding windows and tried to make the Gough more comfortable. 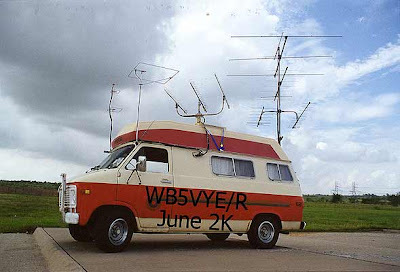 I've been an amateur radio operator for some years and succumb to the contesting and emergency operations. Since no one in the family wanted to ride in the Gough, I decided to move the radio station out of the house and into the Gough. 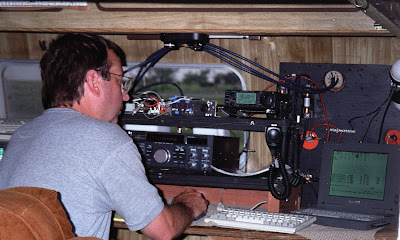 I did some portable operations during VHF contests three times a year. In those days, every drive out of the metro-plex usually involved scouting parties to some remote location in the state or in some cases out of the state, that would avail us of a great contest location. I wish I could type faster. There are two or three stories that I'd like to pass along to you. So, I guess if you aren't too bored I'll get them hammered out some time this year. 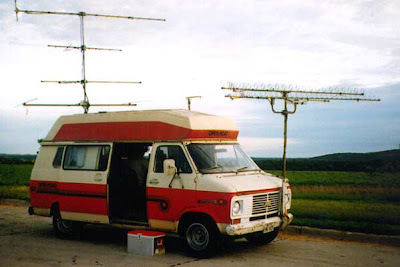 I think it was 1988 that I tore the camper stuff out of the van and made it a real radio van. I'm not a carpenter, so It was not pretty but the table was strong. I raised the bed (that You sleep in) . so that the storage space was enhanced to allow for the porta potty, generator and a few hundred pounds of radio gear and tools. I had enough tools in the Gough I could do most any kind of repair short of major engine or transmission repair. Every year I replaced the belts and hoses just in case. 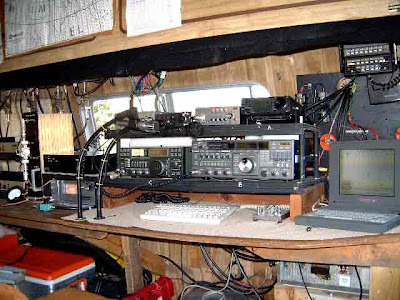 As time went by, the Gough evolved into an amateur radio roving station. It was nothing special , but it was mine and I loved the freedom that th' gough afforded. 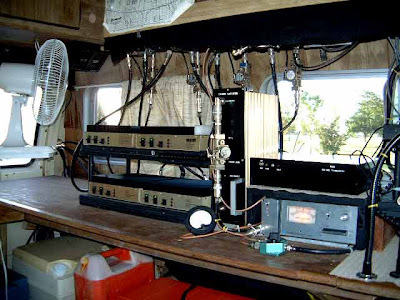 The Radio capabilities would allow operation from HF through Microwave frequencies. 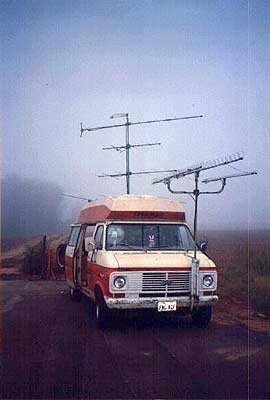 There were gain antennas on VHF and above bands. After each trip, there was to me, a major rewiring project at hand. We tried to improve operating capabilities and maintain some sort of comfort level. I have spent several nights in the Gough. The earliest Rover configuration had one or two IF rigs with four trans-verters. They were 220-432-902 and 1296. These were built by K5BYS. Ultra low power on all the trans-verters. I remember the first conversation I had with W5HN. I was in Justin Tx. on a Saturday morning. There was a 6 element log periodic antenna hanging inside the Gough. The Gough had a fiberglass top. The 430 trans-verter was capable of about 25mw out. I was playing with the rig and antenna combination, with no hope or expectation of being heard. I guess the atmospheric noise floor was low enough for some one to hear me call CQ. W5HN answered me, I was floored. We talked for a few rounds and I explained that I was only running 25 or so mw to an inside antenna. I didn't know at the time who W5HN was or what kind of super station he had. from NE Oklahoma. The display was three inches square. It worked great. This morning the fog was so bad that if we had not had the GPS we would have drove by the turn back South to Hwy.281. One of the last roves. We are north of Joppa Tx and South of Lampasas. This what we found in B.W. Brammer's closet 50 years later. B.W. Brammer was a complex person from another era. He was born in TX, family moved to California and then migrated back here when he was three (~1914) His family settled in Wise county TX. BW was raised a peanut farmer. Between raising, Peanuts, vegetables, working long hours as a layout person for 'Baker built Feeders' and a family with five kids, BW enrolled in an electronic correspondence course from ITT. He fixed Radios and TVs for several years. He did all of this with a seventh grade formal education. BW stored maybe fifteen or so old radios above his bedroom closet some fifty years ago. Unfortunately, dry rot and termites have taken their toll. I wonder what station he was listening to as he switched OFF the ole Zenith Radio. 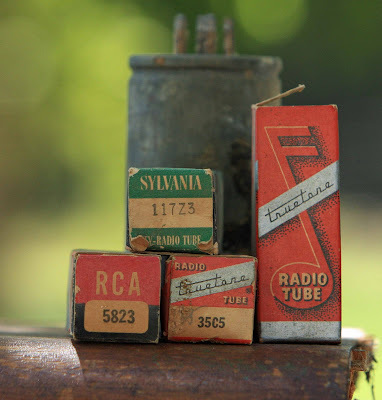 There is some magic attached to an old tube type radio. When you turn it on, there should be audio from the 40s coming out the electro-magnet actuated speaker. Instead, there is silence, then, maybe a hiss from one of the paperwound condensers as it outgasses a pungent odor. Wait , hold it, there it is again. There was some static from the speaker!? No, it was only a ghost, a whisper from the past , escaping, never to be heard again. How many components can you name? 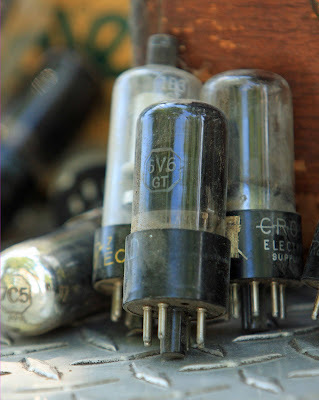 Did you ever smell the capacitors in an old radio heat up? Ever tune for less static? 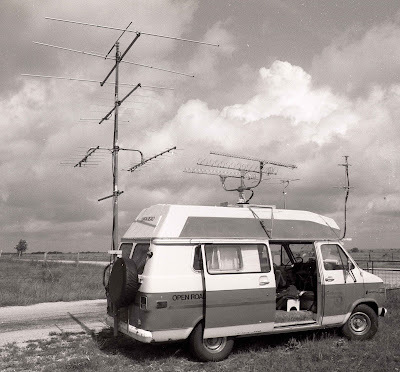 Did you ever go outside to make sure the antenna is connected?